Adelina Sotnikova of Russia currently leads by less than a point after the ladies short program at the 2011 World Junior Figure Skating Championships. The Russian girls dominated the Junior Ladies Short Program as expected with Adelina Sotnikova edging out Elizaveta Tuktamysheva by less than one point for first place, however, USA’s Christina Gao is not far behind in third. Overall it was a high-level competition with seven girls going for a triple-triple combination and four of them landing a clean one. Sotnikova’s Waltz program was highlighted by her triple loop, double Axel, excellent level-four spins, and the footwork, however, she underrotated the toe in her triple Lutz-triple toeloop combination. The 14-year-old from Moscow scored 59.51 points. A Korean reporter asked the Russian skaters what they think about Yu-Na Kim. Tuktamysheva turned in a strong performance of her oriental-themed program to Harem (The Casbah) by R.E.G. Project. She opened with a perfect triple Lutz-triple toe combo, followed by a triple loop and an excellent double Axel with her hand over her head. Her flying camel spin merited a level four while the layback and the combo spin were a level three. The 14-year-old improved her seasons best by a little over one point with her score of 58.60. Tuktamysheva confirmed that she is working on the triple Axel, but won’t try it tomorrow in the free skating. Skating to Violin Concerto in E Minor by Felix Mendelssohn, Gao produced a triple flip-triple toe combination, triple loop and two-level four spins. 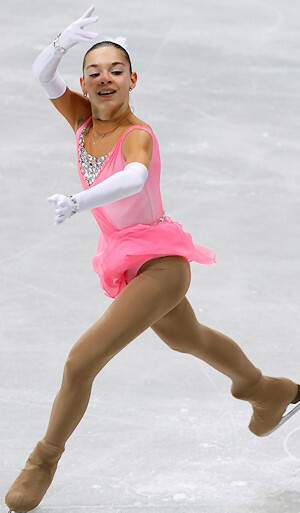 However, she barely hung on to her scratchy double Axel. The American earned 56.80 points to prevent a Russian sweep of the short program. Russia’s Polina Shelepen delivered a clean program to a modern version of Swan Lake (similar to Daisuke Takahashi’s famous Hip Hop Swan Lake in 2008) that featured a triple Lutz-triple toe, a triple loop and double Axel. Her spins were all graded a level four and the Muscovite was happy about a seasons best of 56.58 points. USA’s Agnes Zawadzki lost quite a few points when she added just a double toe on to her triple toe for a combination. Her triple loop was a little shaky, but the double Axel was fine and the spins merited a level four. The reigning World Junior silver medalist is sitting in fifth with 53.17 points. Japan’s Miyabi Oba landed a solid triple Salchow-triple toeloop combination, a double Axel, triple loop in her powerful performance to Liberty Fanfare. She scored 51.82 points to come sixth. “As I didn’t have so much time to prepare for this competition, I just wanted to skate without any mistakes,” said Oba. “I didn’t expect to place as high as I did, and therefore I am very pleased. “I hardly believed it when I was told that I have been selected for Junior World,” she added. Teammate Risa Shoji of Japan nailed a triple Salchow-triple toe, but her triple loop was underrotated. She showed good attack and connection to the music in her routine to Libertango, and finished seventh with 51.49 points. Zijun Li of China had a solid outing with a triple flip-double toe, triple loop, double Axel and nice spins to place eighth (51.00 points). The elegant Yretha Silete of France also skated well with a triple flip-double toe combination. She is ranked ninth (50.24 points). U.S. Junior Champion Courtney Hicks had drawn to skate first out of the 30 competitors in what was her first international event. The 15-year-old went for a triple flip-triple toe, but the second jump was cheated and downgraded. The double Axel and triple loop were high, and she hit original positions in her strong spins that were all graded a level four. She earned 49.98 points and came 10th. Yuki Nishino of Japan underrotated both her Lutz and loop to finish 11th (46.09 points).